age, exclusive of volunteer wheat. y1 -194 in the w Br SSM madeVT I hs4 page . / Subject to revision. 3/ hio e made from U. S. wheat also includes shipments to U. S. territories. July 31 will be reached. oilbearing and other crops and for summer fallow requirements. It is imTossibie to make an accurate forecast of wheat yields for next year. 'light on the export situation and its effect on price. Sharpest, but advanced above it later in the season. a consieraaly te 1917-18 record. because of the unusually large prospective 1947 crop. About 190 million bushels of wheat (including flour) of the t0 mlllcnbushebl ob. Argentina indicates a reduction of about 13 percent from 1946.
which received significant quantities of U. S. wheat in 1946-47.
and about 83 percent of the 1935-39 average of 458 million bushels. Wheat prices, except for August 1946, have been above parity since early May 1946. 1941, both the supply and demand were very large. ment of these premiums, they are not reflected In the ceiling shown in the chart. in response to current high prices. feeding to wheat this fall. if 14.3 bushels per seeded acre, the 1948 crop would be 1,070 million bushels 2/. the 1948 wheat crop will be strong until after the 1948 corn crop is harvested. heat, is shown in The Wheat Situation for July 1948, page 2. Ibuted in practically all of the wheat areas of the United States. Large scale exports began in late 1914. Subsequently, there has been a demand! for more wheat th,.n was available for export in all surplus producing countries. 14 percent and civilians in occupied areas received 30 percent (table 4). United States Foreign Relief Program administered by the State Department. than supplies available for export. States exports would be sharply smaller. recovery in production in many importing countries, including those producing rice. low levels; and (U) continuin,- exports of vhoat to deficit rice-consuming areas. our ca r' .o';:r position by the end of 1948-49.
by the United States in international affairs will continue to be very important. in the population in the past decade. later in the season (table 5). farmers at 90 percent of the mid-June parity 4/, will end December 31, 1948. The closing date for placing wheat under loan customarily has been December 31.
seed, 81; and exports and shipments 43.
loan program was the most important factor in domestic wheat prices. from the war became the important price factor. slightly below the 1,436 million indicated a month earlier, and still a record. 1943-44 imports amounted to 136 million bushels. 100), which in mi-August 1947 was 235 percent. more than 400 million bushels, or about the same amount as was exported in 194C-47. favorable,.exports may be increased above 400 million bushels. the November program to rake a total export procurement of 200 million bushels. considerably larger crop than in recent years in Australia. crops in Southern Hemisphere countries and elsewhere. weather turned cooler and beneficial rains were received. the Spviet Union has been fairly good and sizeable exports are possible. Morocco but production is indicated to be below a year ago in all areas. provided some surplus for export. and about 17 percent below the 1935-39 average of 458 million bushels. land (fig. 3, table 11). bushels would probably result in reduced use for human food or for livestock feed. ous record of ^1.93 for 1917-18.
million bushels, which is used as year-end carry-over in the 1936-37 marketing year. flour in terms of wheat. Wheat imported for milling in bond is excluded. Included food for both civilian population and the military forces. S1,000 bu 1,00 bu. bu. 000 bu 1000 bu 1000 bu. 1,000 bu. 1,000 bu. A Excludes flour milled in- bond from foreign wheat. : Mil. bu. Mil. bu. Mil. bu. Mil. bu. nor 6.5 million bushels of Canadian wheat milled in bond for export. 13, 1946 to 187.1. On June 30, 1946 ceilings expired. / Beginning 1938 includes unredeemed loans at average loan value. summarized in The Wheat Situation, July 1947 page 13. 2/ December 1 price, 1900-1907. 1,000 bushels 1,000 bushels 1,00bushels Cbnta p bu. Commerce of the United States. Includes flour. :Mil.bu.Mil. bu. Mil.bu.Mil.bu.Mil.bu.Mil.Bu.Mil'.iuMil .bu. Mil.bu.Mil.bu.Mil. 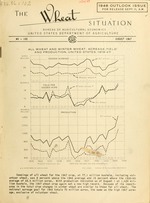 Acreage, yield, and production, by types, 1940-45 ..
International trade in wheat including flour,..